The network infrastructure makes or breaks your solution at every level. The key components of it directly impact the issues customers are most concerned with including performance, resiliency and security. Virtela is unique in its ability to meet these challenges for the enterprise participating on the global stage. 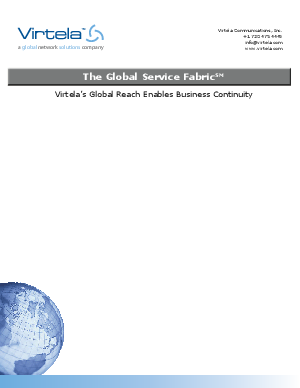 This paper outlines the capabilities and benefits of Virtela's Global Service FabricSM.